Recently, I had the privilege to be included in a pipeline generation boot camp hosted by Dan Tyre of HubSpot. Our focus was on building the skills needed for inbound selling through outreach to the right leads and a process to keep the fires warm. Of particular interest to me was the specific steps of working through a connect call. The central question for me was, how could I connect with lots of people efficiently and then quickly decide who the best fits were for a working relationship? Dan helped us sort out what to do during a connect call. Side note, if you ever have the chance to work with Dan, I highly recommend it. In a word, he's awesome. As a relatively new HubSpot Agency Partner, I wasn't sure what I was in for except that I knew I dreaded calling leads to get business. That's likely part of what appealed to me about inbound from the beginning. Leads came to me! No calls required unless someone asked. After all, I'm no different than so many other creatives. I'm an introvert by nature. But I'm also an entrepreneur, and that meant I needed to take action to build the future of my business. If you've skimmed the headlines of this article, I know what you are thinking. How is calling people inbound selling? 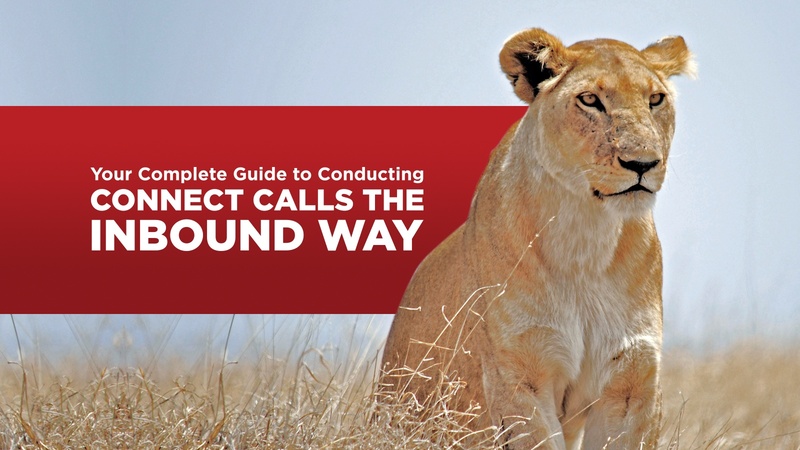 Yes, you could technically classify it outbound, but what we've really learned is how to flip outbound on its ear by using all the awesome things we know work from inbound. In other words, inbound selling is outreach done the inbound way. The informed way. Here are some of the valuable lessons I learned from Dan and HubSpot on how to use the connect call to begin a repeatable process to create a sustained pipeline using the principles of inbound selling. In particular, these steps are ones I use in nearly every connect call as a way to decide if a prospect is a good fit or not. I hope these steps help you as much as they have me. The XK3 Agency is on pace to double our business this year, and that success is all started with the tools outlined here for a connect call. Ok, that sounds simple enough. This is where personas are critical. So many clients want to skip the step of creating personas, but we always insist it's worth the effort. If nothing else, putting personas down in writing helps you to decide who "not" to work for in the future. You dramatically increase your odds of success by creating accurate personas and then using them to determine who to pursue. Once you've decided a company might fit your persona, start connecting the dots to reach the right person. Check to see if you have a contact in common who can introduce you to the right person. Mining your own contacts or even conducting searches of LinkedIn for companies that either fit your persona or might have connections you know are a great start. Before you dial, do your research to help! Why research? Our business is about helping people reach their goals. In fact, for me, that's part of my personal mission. Find something about that person and the company they work for that you can help with right away. People are smart. They know you may be reaching out for business, but if you've noticed something that could help them right away, use the connect call to share that info. What kinds of things do you look for in your research? Look at what the company does online. Do they blog, have calls-to-action on the website, or use proper search engine optimization practices? What are they doing on social media? Are they active? Engaged? Dormant? Also, spend a few minutes digging under the hood of their website using your browser's Inspect features and skim through the HTML to find out what tools they are using to track, blog, or interact. If something a bit more automated is easier, tools like BuiltWith can easily help identify what tools a site uses by doing the same function for you. At first, it will take longer than expected, but it will get faster with practice. The critical step is identifying a good reason to connect with someone, and there's no better way to do that than offering them help right away. You've dialed? Have a solid, friendly greeting ready! After you've done your research and have a good reason to call, you have to be mentally prepared each time you dial. You may leave lots of messages or get no response from some, but always be ready to jump into a conversation. After all, you called them! Ask them how they are and mean it! They might have a crisis on their hands and just be in the middle of a crappy day. Do what you can to make it better. Practice and role play with a colleague so that you can get the flow of conversations down. Tell them you did some research. State your reason for calling, and then ask for permission to continue the discussion. Here's an easy tip. Stand up for calls. This one is important. Why? Standing straight will help you naturally sound less nervous, and good posture will help you sound more confident. Mom was on to something all those times she reminded you to stand up straight! Don’t worry if you mess up at the beginning. Being persistent is key to winning the game of shelping! No that is not a typo. Shelping is what you do when you call and mix selling with helping. For me, it's much easier to imagine I am calling to help and not selling because helping is what you are doing! Give them time to process who you are and why the heck you are calling them. They may need a moment to formulate an answer. Even if they have visited your website or they filled out a contact form to download an eBook from your site, they might not remember doing so. Again, PAUSE! Then state your reason and ask permission for continuing the call or ask for another time to reach back out. Have permission to keep talking? Great! Build rapport. This calls back to your research before calling. Is there a common interest or connection you can talk about? Our business is about helping, but that starts by building relationships. Get to know people. The high school they attended. Charities they support. Get to know the personality of the person you are talking to and keep that in mind. Pictures can tell you a lot. Are they playful in their images online? Do they always look reserved? Tools like Crystal can help you form a better idea of someone's personality. I like to think of the time I spend getting to know people as a decision to conduct my Business to Human. B2H for short. People are busy, and you don’t want people to waste your time, so treat people as you would want to be treated. After all, remember you are calling to help. It is a buyer-centric world. It is about them and their needs, not you. Address resistance, if you get it. When people are searching for how to solve a problem they are usually appreciative of helpful information that may help them solve it. Maybe they found what they needed on your site, and perhaps they need more clarification. There are those that don’t want to talk. The timing is bad, they really have no need, or they may be the wrong person. Most of the time resistance won't come up if you do your homework. If, however, you do get resistance, here are some ways to handle it. "It sounds like you weren’t expecting my call." This is the part of the call you put them at ease with something funny or intelligent depending upon the personality type. Remember, you are only calling to help. Talk about the research you did on ways to improve their website traffic. Who doesn’t need that right? "Is there a better time for us to talk?" Always remember to be respectful of their time, and don’t forget to ask permission when moving forward. There are many reasons you might be reaching out. Just make sure the particular one you are talking through is relevant to the person you are calling. Do they need help with lead generation, client engagement, customer acquisition or competitive advantage? You may only get yes, no, or maybe responses, but yes's can lead to more in-depth questions and a more engaging conversation. Have a clear positioning statement developed before you call. If you don’t have a clear positioning statement, create it before you start the connection call process. This was invaluable for me. Even when you reach out to people that you have known for a long time, they will ask exactly what type of leads are you looking for? You should able to tell them quickly what kind of companies or personas you are hoping to find. Need help creating a positioning statement? Crafting one is important. Without it, you are in the dark. A positioning statement should help clarify your company’s purpose. That also identifies your reason for calling. If you don’t have a positioning statement and you aren’t responsible for it at your company, then ask your leadership team to supply to one to you. A good positioning statement should be the foundation that solidifies what you do, who you do it for (with specific details), why you do it, and in brief, how you do it. Ask specific questions, but don't try to qualify a prospect in connect call. A connect call is the opening of a dialogue. Your goal is gauge interest and fit, but there's no way you can fully qualify someone in a connect call setting. This is the first contact with someone. Keep it short. No more than 5-10 minutes. If there is interest in the ideas presented, the goal is to set another call as quickly as possible with your prospects schedule. You've done your homework and called someone that may very well need what you do, but you've also called out of the blue. It is their show, and you are there to help. Pressing and pushing is not the inbound way. This is a crucial difference between outbound selling and inbound selling. It's all about helping and knowing when to passively let someone come around to the idea of your help. Keep the call about them and focus on what you can do to help. Ask questions. "I’m calling to help with lead generation, customer acquisition, and competitive advantage. Do you need more customers?" Remember to PAUSE, PAUSE, PAUSE. They will probably tell you everyone needs more customers. Have fun with the conversation. Tell them something great you found on their website. Ask them questions about what they do. If you read their blog, tell them so and that you reposted it with a comment. Keep the questions relevant to how the lead came to you. Is it an inbound lead? A warm lead? A current customer? Do they have difficulty demonstrating return on investment? Each would have unique questions that work best for them. Give them tips on what might drive more traffic or help them with their site. Rely on your research to guide these questions. If you've had a good discussion, repeat the challenges you heard. Ask them if you are on the right track. Listen for their tone of voice and the choices of words they say. Over time you'll pick up on whether someone is genuinely interested or not. Use these clues to help you to identify not only their personality type but help get you on the same page with them. People like to know you've been listening. Recapping is a great way to show them that you've heard the problems or challenges they are trying to solve. Once someone knows you care about their issues, they are more likely to take the next step. Get that next step on the calendar. If it makes sense, schedule a Discovery Call as a next step before you let them go. So the Connect Call has gone well. You've had a good, brisk discussion and you think you might be able to help this person and their company with challenges they face, but there's more to learn before making that decision. You've identified some areas where you can help. As for additional time to dive deeper so you can understand their goals and challenges more thoroughly. This next call, the Discovery Call, is where you can really get into a deeper discussion. Together you can review the findings from a Discovery Call to decide if working together is best for both sides. Typically, these Discovery Call are 30 to 45 mins, but the time can be worth it for both sides since excellent information can come from a broader discussion. By walking through a Discovery Call, you will be able to guide them toward the right solutions. You may or may not be a good fit for them, but you will know after this Discovery Call if you can help them or not. The feedback they receive should be valuable to them whether you work together in the future or not. They can still use any knowledge gained to help them move their company forward. Being helpful is the right thing to do. Even if for some reason, they turn out not to be your ideal customer, they will remember that you were kind and helpful. You never know who else they know or when things may change that makes them a much better fit for your help. If you've been helpful, you have a much better chance of them reaching back out to you when that time comes. As much as it might be tempting, save that in-depth exploration for a longer, Discovery Call later, but work to get that call on the schedule before you close the Connect Call. Then there are no questions about the next date and time to meet. Follow up with a brief recap email. Don’t forget to follow-up with the prospect via email after the call. This is vital step to help you stay top of mind. Make sure what you discussed is outlined in the email. Include a full recap with a little more depth from your call. Offer to let the client add questions or items that could be included in the Discovery Call you have scheduled next. Even if you haven't had the best connection, still follow up with a clear thank you. Thank them for their time. If a Discovery Call is scheduled, use the recap email to keep the excitement level up and the momentum going. It might also be a perfect time to give a prospect some homework that may make the next call more productive. Also, make sure that if any teammates need to be on this next call that they are invited. Step, repeat and learn as you go. These are the basics to make a connect call the right and helpful way. Everyone at some point will need a process for growth in place. It takes time to build leads and rapport to gain clients’ trust and their business. Remember to begin with the end in mind. Think before you make that next dial. Do the research, be human, be relatable, treat others are you want to be treated. The data proves that those who dial win, but those who do so by following inbound principles of informed calling win the most. Now you've got the tools for a proper connect call. What are you waiting for? At The XK3 Agency, we don't see Inbound Marketing and Inbound Selling as two separate processes. They are two halves of a whole, SMarketing. Yes, that's a clever blend of the two. In today's data driven, consumer world buying habits have changed. Sales and Marketing must be on the same team. Want to learn more? Download your FREE guide Collaboration is Required. How Sales and Marketing Can and Should Work Together to Improve Results.